Have some very exciting news to share this morning, my youngest sister and her husband have just hadÂ a baby, born just over 4 hours ago and called Theola Elodie Rose. Cannot wait to meet her and welcome her to the family, hugest congrats and much love to both Holls and Lee! I’m up early becauseÂ I have a list as long as my arm to get through today. Part of my problem I think is that I am a perfectionist. Take the online course as an example (launching next Wednesday, very exciting). I am spending hours over the layout because I don’t want it to look like a series of posts I want it to look like a magazine. Design is a visual thing right so every image and graphic design tweak has to be perfect. Plus I want everyone taking the course to feel inspired and motivated and how can you do that if imagesÂ are plonked on a white background? Yesterday we spent an hour (repeat an hour) on the size and colour of a little circle with a quote in to go against one of my rooms.Â Will anyone notice or care probably not, but I do so I can’t sign it off until its just so? Crazy do you think? My husband thinks so, there was a lot of ‘Ab’s (everyone in the family calls me Ab’s btw) let it go, move on’. There was a lot of sighing – ALOT! What do you think of this interior? I came across it in Spanish Elle Decor and it belongs to Bea Deze a fashion designer. 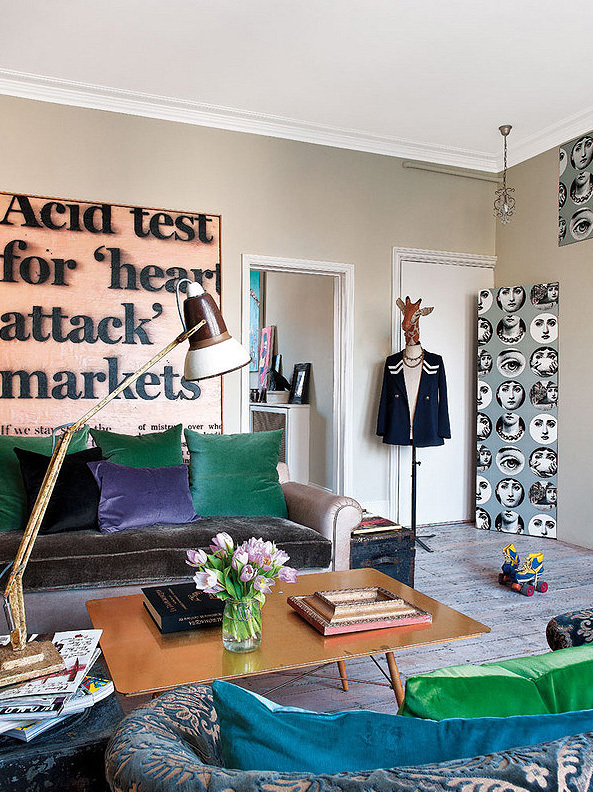 Its in Notting hill and has an incredible boho yet eclectic glam vibe. This apartment does what all homes should do it tells us something about its owner. Its arty, its cool it combines a whole lot of elements together, none of them matching but all of them making perfect sense. I talk about it in the classes alot but if you can reign in your colour palette you can pretty much mixÂ to your hearts content. 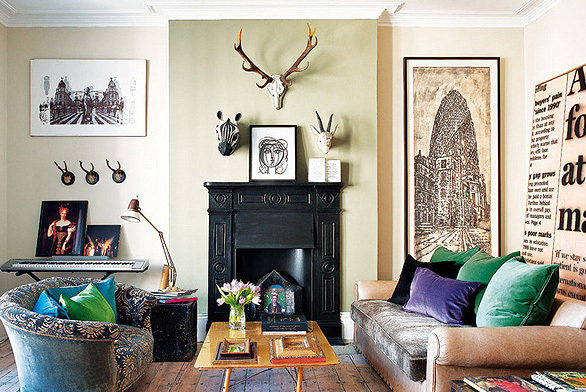 Eclectic interiors are the hardest ones in the world to pull off simply because of the non matching thing – so it takes a bit of skill, a big bag of confidence and a little practice. But when you nail it, you nail it! Right then back to tweaking the course,- lets hopeÂ I don’t get caught up in circles today , literally and metaphorically speaking!